It has been a tough start to the fishing season here in southern NB. With still a foot of snow in the backwoods as of April 28th, water levels may stay elevated for a while yet. This makes it hard to fish many of the rivers in this part of the globe. I say "hard" but not impossible. There are some changes for many anglers this season and some long standing restrictions still in place. The online fishing forums have been alive with chatter on all these management strategies and there are as many opinions on the topic as there are fly patterns. If you don't fish then you'll have to take my word for it, there are a ton of fly patterns. 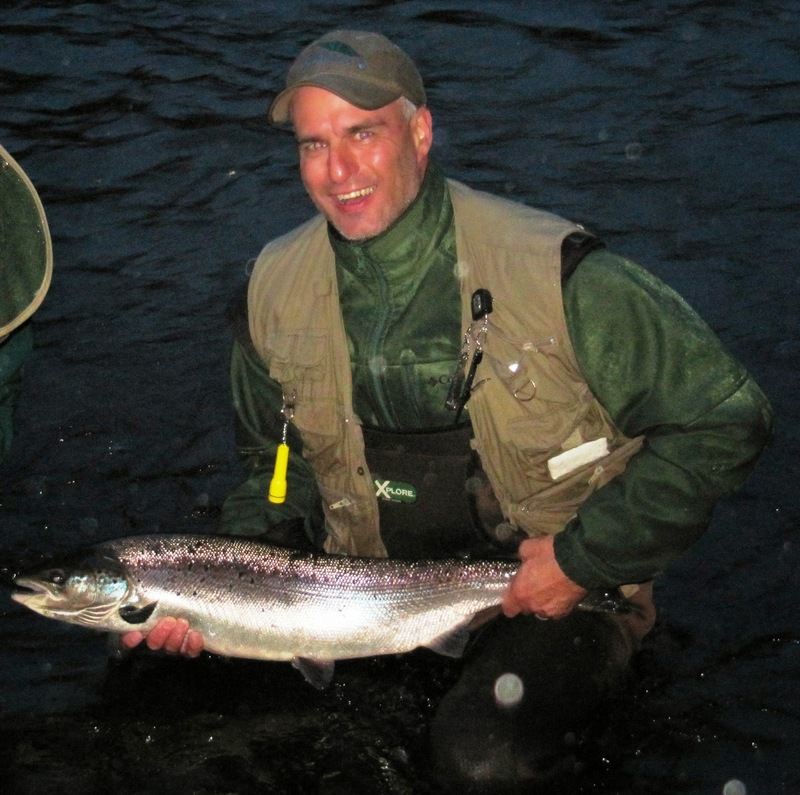 I caught this Atlantic salmon in 2013 and released it saftely. One of the biggest changes for this angling season will be the fact that no Atlantic salmon can be caught and kept this season in NB. For those who ply the waters in the Sussex area this is not really to concerting as our local waterways have been closed to salmon fishing for a number of years now. However, for those who make regular trips to the Miramichi or maybe the Restigouche Rivers this will mean a huge change in attitude. Personally I fully agree with the changes implemented by the Department of Fisheries and Oceans. The intent of the change is to give the salmon a fighting chance at recovery. If we keep fishing and taking fish out of the system, it is very hard for nature to recover. In order to make the $40M (a rough guess) a year industry sustainable we have to make some sacrifices. A catch and release fishery is still very rewarding for the angler and let's face it, who really fishes for sustenance now a days. The Kennebecasis River has a catch and release section for all fish species and anglers should know where this is. It is the responsibility of the angler to know where he or she is and what regulations apply to the water he or she is fishing. The catch and release section on the Kennebecasis River is above the McCully Road bridge (by the potash mine) and extends up to Ketchums Brook near Portagevale. This management tool was established to protect superb breeding habitats. A further management section was created on the Hammond River and a delayed season opening exists on a portion of that river as well. For more on angling regulations check out the 2015 Fish Guide. Not all anglers understand the need for habitat and species conservation. In fact some see conservation as an infringement on their valued hobby. Some anglers, either knowingly or unknowingly, have negatively impacted the streams they call their home. There are concerns like introducing non-native fish into streams or maybe diseases or insects or worms that might impact the natural ecological balance. An example of this on the Kennebecasis River is the recent presence of small mouth bass which are not native to the Kennebecasis. While many people love fishing for small mouth bass, these aggressive feeding and prolific breeding fish can readily out compete speckled trout and Atlantic salmon for space. This shifts the natural balance within the river and makes it harder for the trout and salmon to survive.